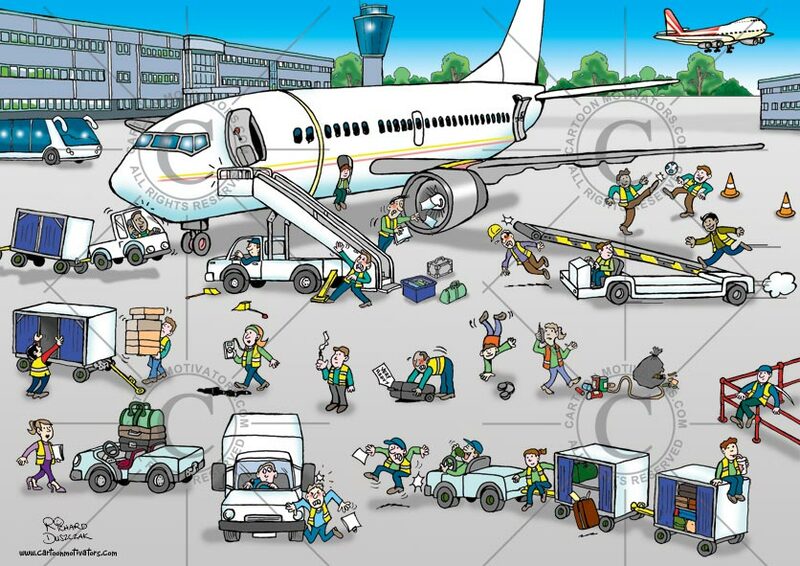 Health and safety cartoon to point out hazards for airline ground staff - multiple hazards depicted in a safety cartoon. Health and safety cartoon to point out hazards for airline ground staff - multiple hazards depicted in a safety cartoon. Some hazards illustrated are: Guy too close to airplane engine and being sucked in, stair vehicle stabilisers going down on guy's foot, driver not paying attention, staff member listening to her iPod and hasn't noticed an oil spill, slip hazard, worker trying to lift heavy case with wrong lifting method, guy smoking, guy being hit on the head by protruding wing mirror, female worker in very high heels, baggage cart has pile of suitcases, chocks not in proper place under vehicle wheels, guy going to get his thumbs caught in luggage cart doors, guy about to trip over cart protruding equipment, should stand clear of stabilisers, slippery surfaces illustrated. This cartoon is A3 in size and the file is very big to download so please be patient. I'm quite happy to make amendments to this cartoon if you feel it would improve the health and safety message. I'm also happy to work with you on creating other health and safety cartoons.